Pavtube Video Converter for Mac offers you powerful converting function to convert any SD/HD/4K video file (MP4, MKV, MOV, FLV, MPG, H.265, XAVC, MXF, AVCHD etc 250+ formats) to HD/4K video(H.265, MOV, MP4, AVI, MKV, MPEG etc any formats you need) by adopting the newest and the most advanced technology. It guarantees that you can say goodbye to all multimedia issues on Mac and make any files usable on QuickTime player, TV, portable devices, tablets, VR headsets, game consoles, etc. It has a perfect compatibility with macOS Sierra, Mac OS X 10.11 El Capitan, 10.10 Yosemite, 10.9 Mavericks, 10.8, 10.7, 10.6, 10.5. 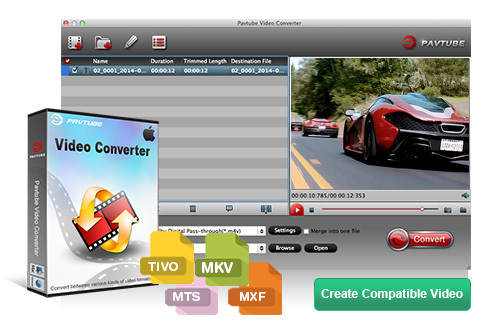 Why Choose Pavtube Video Converter for Mac? Pavtube Video Converter for Mac supports to handle 4K/UHD/4K/2K/SD resolution video includingvarious formats not only from online websites but also from professional camcorder like Sony/Canon/Panasonic/Samsung etc. Extracting audio off movies with lossless quality are allowed. Watch any movie through your Mac with no limit any more. MOV(QuickTime), H.265, MP4, AVI(XviD), ASF, MPG, MPEG-1, MPEG-2, 3GP, 3GPP, WMV (Windows Media Video), FLV (Flash Video), MKV , XAVC, TP, TRP, RM, RMVB, TS (MPEG-2), VOB, DivX, WebM, MXF, OGV, VRO, etc. MOV, MP4, H.265, WMV, AVI, M4V, MPEG-2, DivX, MKV, DV, MPEG-1, VOB, 3GP, 3G2, ASF, MXF, MPEG-1 NTSC, MPEG-1 PAL, MPEG-1 SECAM, MPEG-2 NTSC, MPEG-2 PAL, MPEG-2 SECAM, DVD-Video NTSC, DVD-Video PAL, DVD-Video SECAM, etc. This High Efficiency multimedia toolkit will be a great helper to make 4K Ultra HD which offers superior viewing experience. Besides, it supports downsizing 4K to 1080P video. Just test it and you will be pleased with surprises! Convert any video to your Apple/Android devices,media players(Windows Media Player/VLC player etc),TVs(Samsung/LG/Sony/Panasonic), PS3/PS4/Xbox, VR headsets etc friendly video formats on Mac for smooth playing. This versatile Video File Converter software allows you to define output settings and optimize the video effect. Flexible video settings are Video Encoder, Frame Rate, Resolution, Aspect Ratio, and Video Bitrate. Adjusting audio settings like Audio Encoder, Sample Rate, Channels, and Audio Bitrate to optimize audio effect. With its built-in video editor, Pavtube Video Converter for Mac allows you to trim, crop and rotate your videos before converting them. In addition, you can also add subtitles, watermarks, metadata info and special effects to the videos. Viewing the ultra-intuitive interface, even beginners have the ability to master all videos you are going to convert. Just one click Convert button, converting a video to multiple video formats in batch makes your digital life more convenient. With AMD APP and NVIDIA® CUDA™ technology, any conversion process accelerates 6X faster speed than ever. A. 100% Lossless Quality: Wraps up media files in a new container to preserve the original image and audio quality. B. Codec Library: It generates a complete codec library for using with Windows Movie Maker, Sony Vegas Pro, Premiere Pro, FCP, iMovie/FCE, Avid MC, DaVinci Resolve, Cyberlink PowerDirector, VirtualDub etc natively.